With the start of July begins a long list of amazing festivals that bring revelry and happiness to many corners of Spain every year. These are some of the best patrimonial festivals in Spain in July. San Fermín can be proud that he has turned into one of the most celebrated patron saints, not only in Spain but in the whole world. Every July 6th, this popular festival starts with the Chupizando en la Plaza del Ayuntamiento, where thousands of people dressed in white and red anxiously await the roar that marks the beginning of a week of diversion and fun. 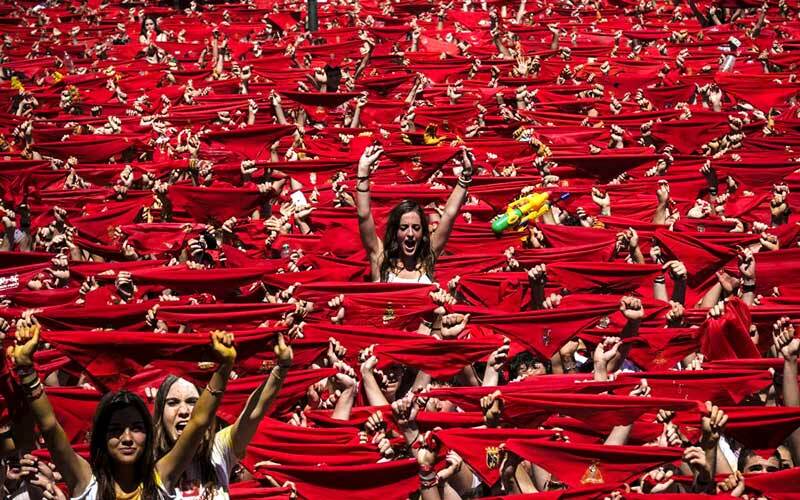 Every year, the word “Fiesta” is written in capital letters in Pamplona. The brass bands and enclosures are the highlights of this festival, and they are responsible for keeping the party alive for the whole seven days. This is one of the patrimonial festivals in Spain in July that can boast a spot in the category of National Interest. There are many foreigners that join this festival every year to enjoy the unforgettable week. This festival is characterized by its relation to religion and its strong historical context. This festival is celebrated in honor of Santa Magdalena, patron of Anguiano (La Rioja). This celebration is known for the part of the celebration in which a group of men line up on stilts, in remembrance of their ancestors, who used them to cross the rivers and snowy fields in the area. The performers wear traditional clothes (skirts and colorful blouses), and they dance with the procession of Santa María Magdalena. Later, roll down a hill next to the church. They eventually land on a “human mattress” that cushions their fall. Finally, they dance different dances on top of the stilts, marking the rhythm with wooden sticks of hazel. For visitors, this celebration is an unusual spectacle; but for the locals, it is religious rite that forms part of the town’s customs. 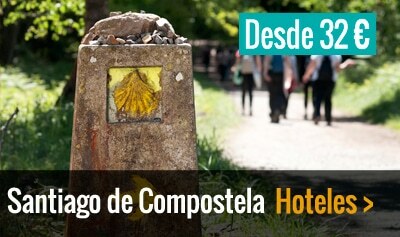 The festivals dedicated to the Apóstol Santiago, celebrated in Santiago de Compostela, is known as being one of the patrimonial festivals in Spain in July with religious solemnity, animation, and its popularity. It lasts for 15 days, out of which July 24th and 25th stand out the most. On the night of the 24th, the sky is lit with an incredible display of fireworks in honor of the Apostle, while the castle recreates the Gothic façade of the cathedral. On the 25th, in addition to it being the Día de Galicia, is known for its religious importance (acts in the cathedral and a procession) and festivities (big heads and giants, regional dances and fireworks). The most important moment of this day is in the morning, when thousands of people flock to the Apostle’s offering with the Botafumiero as the main event. The following days offer different expositions, concerts, and other festivities. Come on, come on, there’s no beach in Madrid! (Or is there?) Because of the heat, the Vallecanos invented an ingenious remedy. 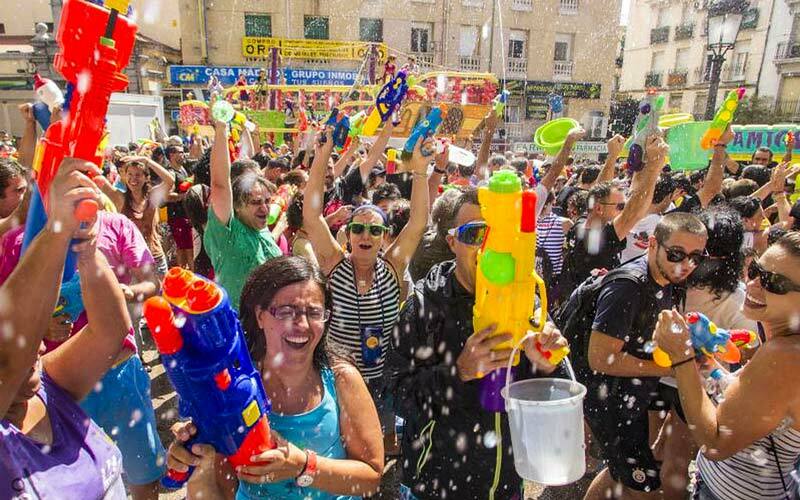 This is why this neighborhood in the capital is known for the celebration for 37 years of the Batalla Naval (Naval Battle), in which the participants throw buckets of water at each other. This festival, which is ideal for combating the heat waves in Madrid, includes in its celebrations the Fiestas del Carmen. This battle is exclusively a party event, in which all you have to worry about is splashing your friends with water and getting splashed right back. This festival, which is celebrated in the Castilian city of Ciudad Real, began with the offering of flowers and other goods from the countryside that the people gave to the Virgen del Prado, patroness of the city. During the Pandorga, the people dress in traditional suits of the region and pay homage to their Virgin by offering fruits and vegetables to ensure a good harvest. Some other important events include the Coronation of the Pandorgo and the Dulcinea, a sort of Mr. and Miss that serve as a representation of the small, Castilian farmers, who are selected by popular vote. 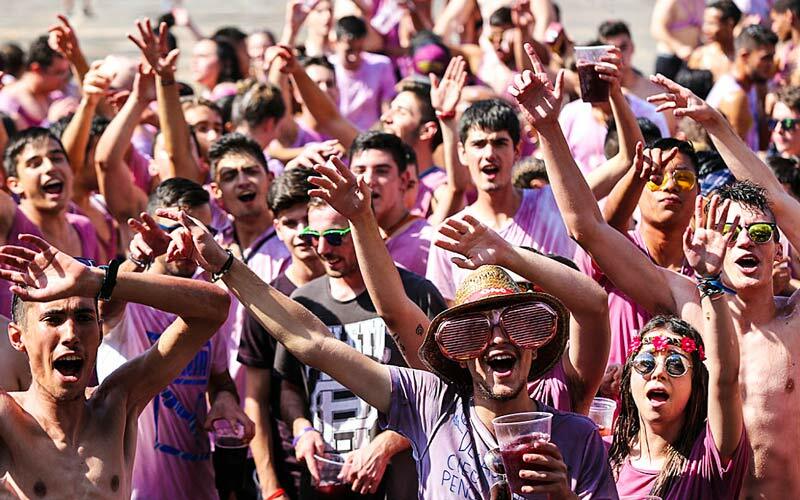 However, in recent years, the event that attracts the most tourists is the Zurra, a battle in which the participants throw sangria at each other. Finally, lots of improper events close out this festival, like the folkloric plays, dances, concerts, and the bull of fire in the Plaza Mayor. Without a doubt, this is one of the patrimonial festivals in Spain in July that you cannot miss. Marta was the sister of María Magdalena, whose faith allowed Jesus to raise Lazarus from the dead. 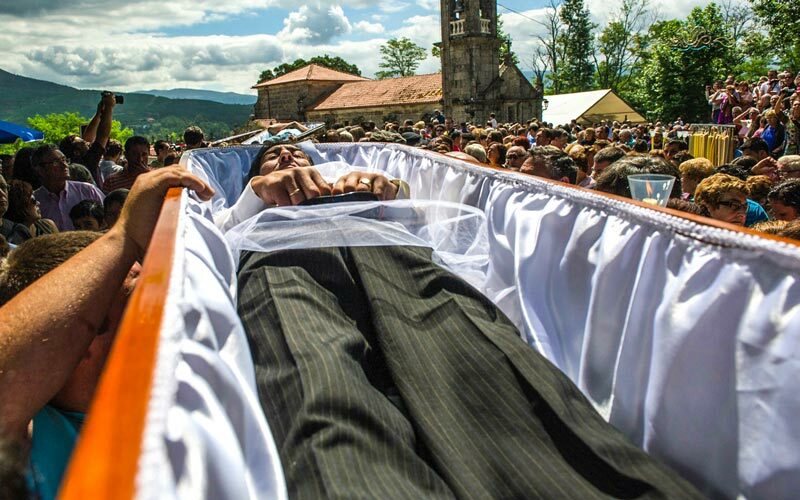 All those who have had a close encounter with death or who have had an experience with it have a reserved place in Riberteme, a municipality of As Neves, in the province of Pontevedra. Every 29th of July, presided over by the image of Santa Marta de Ribarteme, people celebrate the oldest pilgrimage of Galicia. This procession is a mix of religion, symbolism, and customs. The most notorious in this multitude of festivities is the custom of putting a few penitent people into coffins so that they can ask for help from the miraculous saint in curing their illnesses and to thank her for saving them. When it gets hot and people start to go on vacation, the possibilities for traveling are infinite. But why limit yourself to the typical destinations? 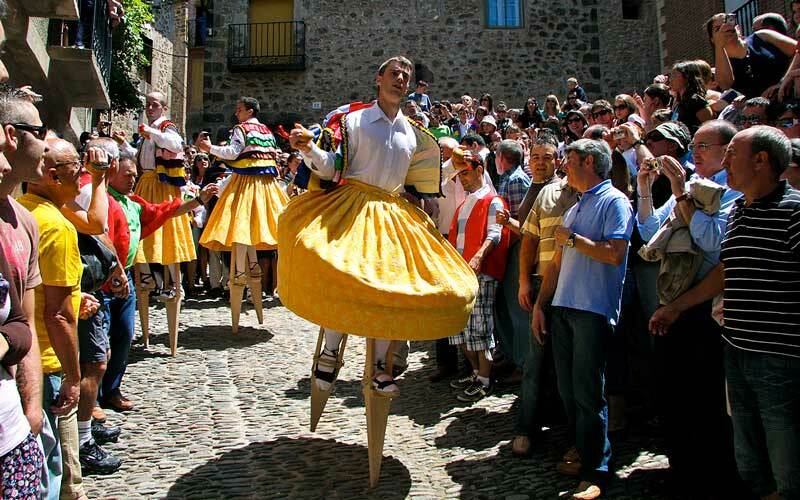 Make your summer an adventure and go to some of the Patrimonial Festivals in Spain in July!